How do you maintain and clean and orderly home? The key to making your home clean and maintaining its cleanliness is by doing a routine home maintenance. You should routinely schedule a home maintenance so that you can squeeze in taking care of your home even with your busy schedule. Doing routine home maintenance not only helps you keep a home clean, it also helps you determine which parts of your house need fixing and repairs as well as upgrades. Home maintenance does not only keep your home look and feel beautiful, it also makes it a safe and comfortable place to live in. We usually rely on professional home maintenance services to help us in maintaining our homes. Home maintenance need to be thoroughly done and that can be made possible with the use of a home maintenance schedule. 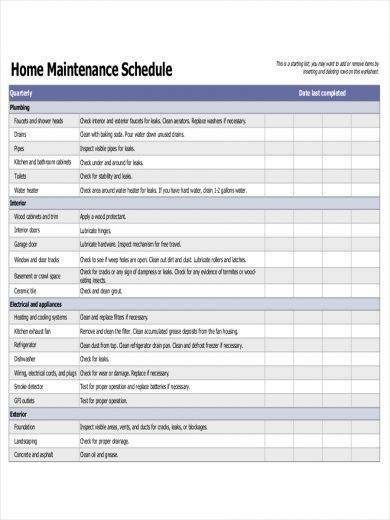 If you need help with doing a home maintenance on your own, then you can check out the home maintenance schedule samples that we gathered below. 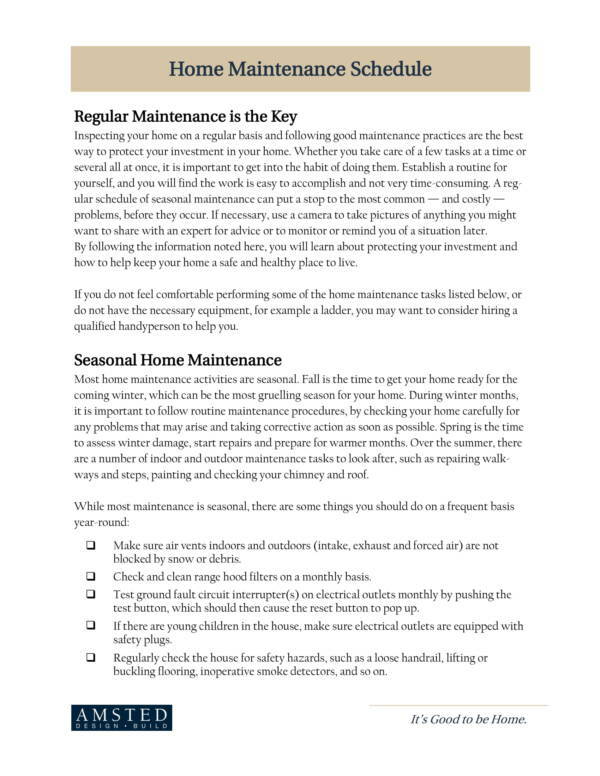 We have also included some basic but important information on what you need to know about home maintenance. 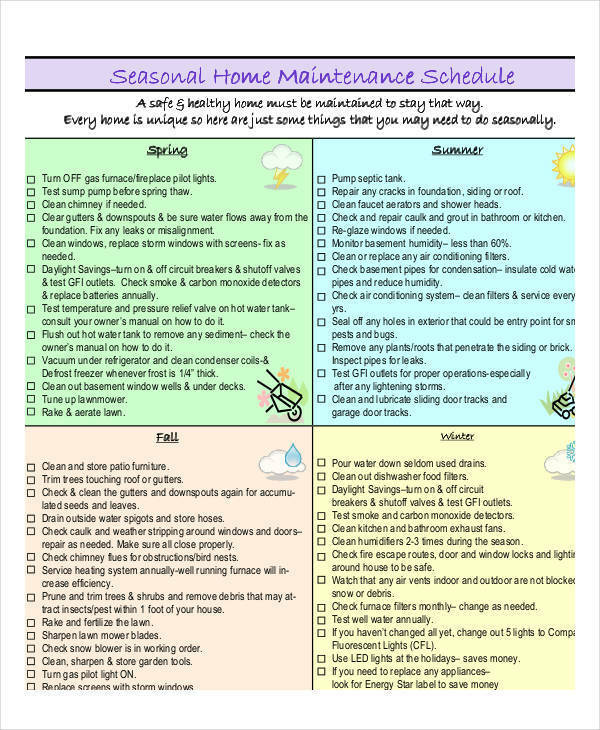 Why Is It Important to Set a Schedule for Your Home Maintenance? Buying a home is costly. You need to pay for a lot of different fees and stuff before you even get to move in. This means that it is not easy to own a home and not everybody can afford to own one. The price of buying a house is never cheap, that is why it is very important that you keep it well-maintained by having a routine home maintenance schedule. 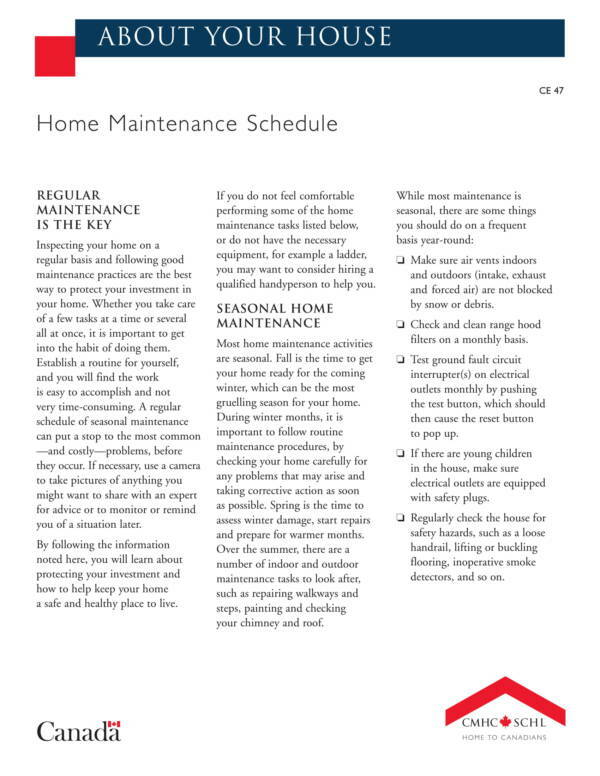 Why is a home maintenance schedule important? Increases the cost of the property by 1% every year – We are aware that the actual price of a property increases over time. That is why a lot of businessmen purchase a lot of different houses and properties. They often refer to it a good investment. But even if it is considered a good investment, its value also depreciates and that is all based on its appearance and how well it has been maintained over the years. A good-looking house that has been routinely maintained is said to have its value increase by 1% every year. It may not be that big of a number, but if you come to think of how much a house or property costs, you will know that is is something to look forward to. Keeps the home clean and orderly – A home is where you and your family lives, and it is important that you keep it clean and organized. Because you have set aside some time to clean the house, you are sure to come home to a comfortable and relaxing place. About time for home inspection – Part of doing a home maintenance is doing inspection on all the parts of your home that needs to be secured and those parts that you seldom can see. A home inspection is very important because it is the only way that you will be able to find out if there are any broken parts of your home that needs to be fixed or repaired. Schedule repairs and upgrades – Scheduling a home maintenance allows you have time to make repairs on areas that need fixing, as well upgrade certain parts of your home that you want to change to stay in style. Helps prepare for the changing of seasons – Maintenance is also important before the seasons change. Because your home will be exposed to different and extreme weather conditions, it is best that you prepare it for what is to come instead of waiting until something bad happens. Keeps the home safe – You can prevent any home hazards or accidents from happening if you schedule your home for maintenance. Examples of home hazards or accidents are damaged wiring, which can cause fire and electrocution; falling ceiling, because it is very old and has not been changed; and broken windows, which is the perfect place of entry for break-ins and robberies. Prevents further damage to one’s home – Small damages can become a huge problem if not taken cared of on time. Doing your routine home maintenance helps you take care of the little things and help you save on the repairs. 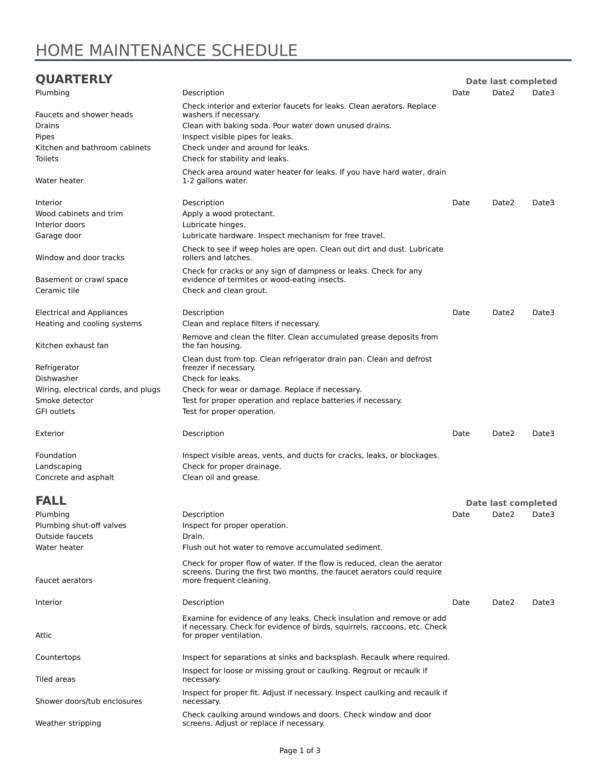 You can check out more maintenance-related articles on our website, like maintenance checklists samples and templates and maintenance contracts samples and templates. 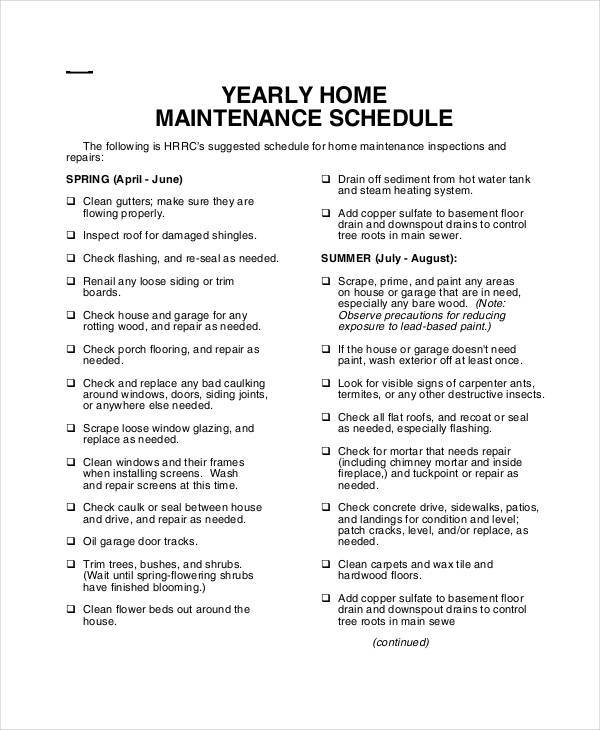 If you have home maintenance schedule samples, where do you plan to use it? You would have thought that there are no uses for those things as they are just plainly samples to show around to people. Well, home maintenance schedules are more useful than what you have in mind. 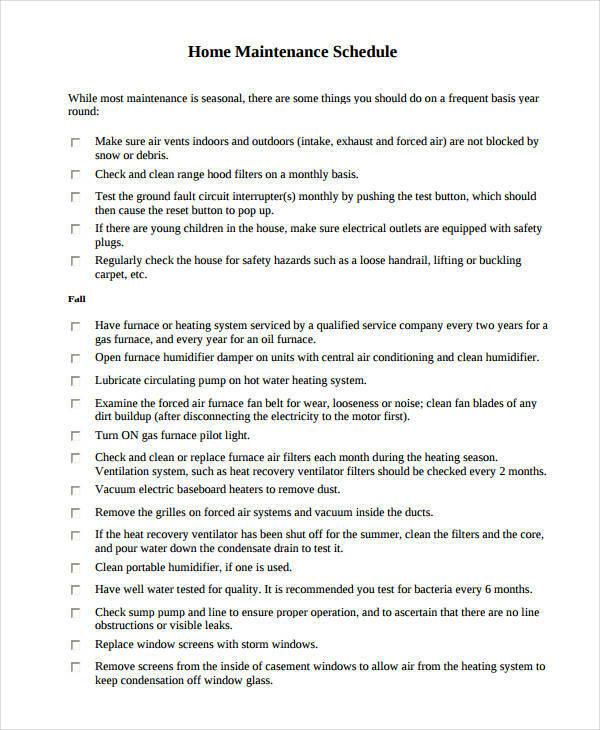 The list below will prove to you that a home maintenance schedule sample is more than just a piece of paper. Home maintenance schedule samples serve as a guide for those who wish to make their own home maintenance schedules. There are instances when you just find it hard to start something, especially if it is your first time and you do not have an idea on what it is all about. 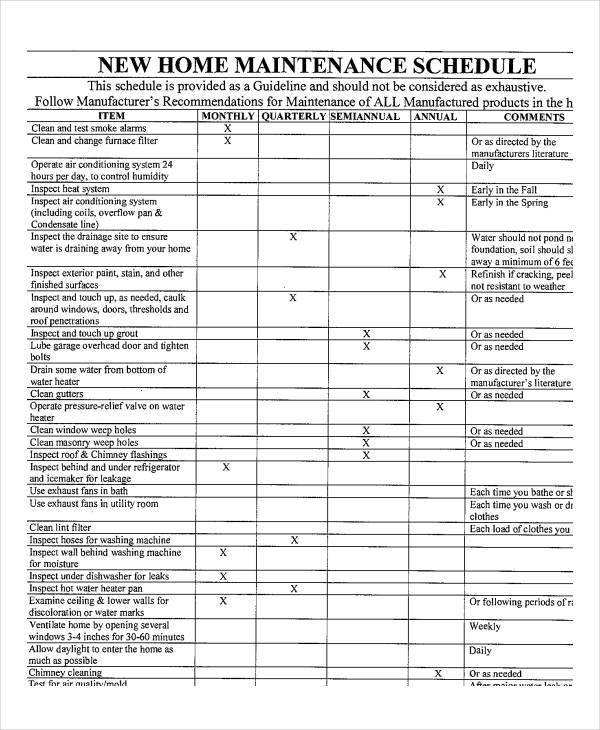 Samples like a home maintenance schedule sample has everything you need to know about how to start your own home maintenance schedule. It will give you an idea of the tasks that need to be done when doing a home maintenance. Home maintenance schedule samples include a complete and detailed list of the activities that should be done when doing home maintenance. These activities include doing home inspections in specific parts of your home as well as making repairs and improvements to the areas that need fixing. 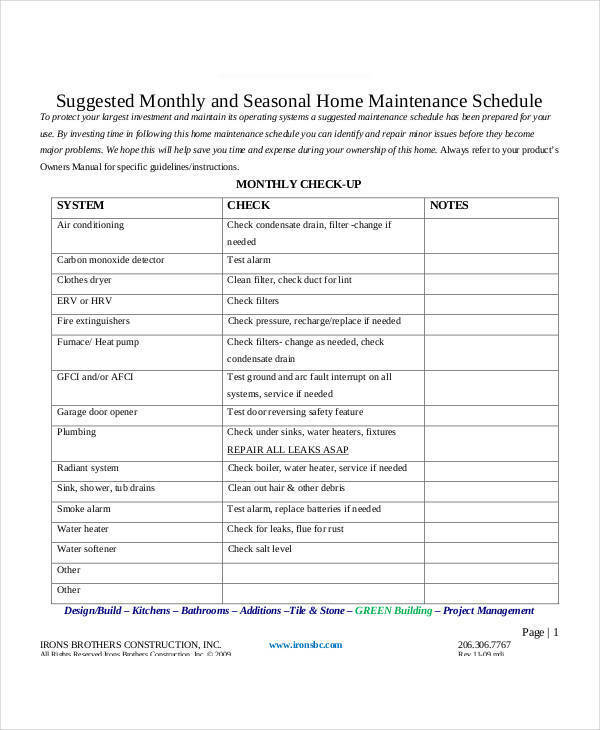 Since a home maintenance schedule sample contains a compete list of the tasks and activities that should be done during maintenance, it will be pretty easy for you to keep track of what else you need to do aside from what you are routinely accustomed to. 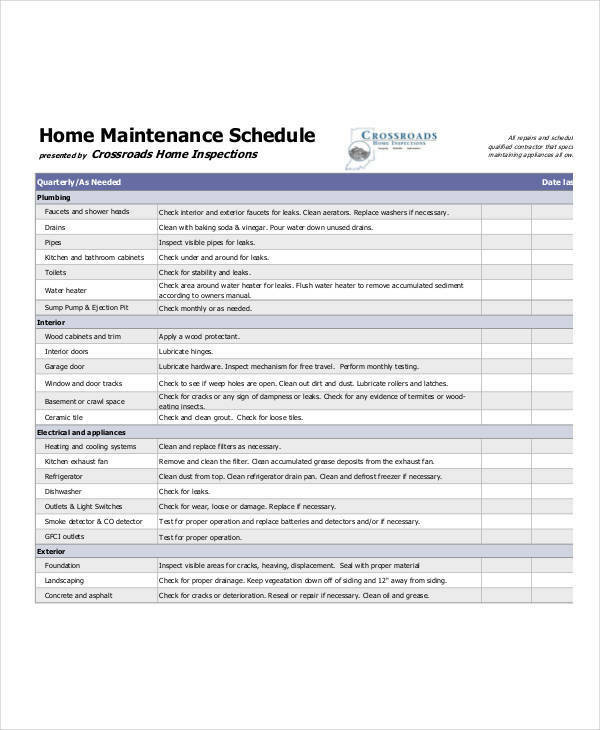 You can use a home maintenance schedule sample as your own. If the the task list is applicable to your home, then you can definitely use the sample as your own. You can even edit or make minor changes to the sample so that it will be perfect for your needs. A home maintenance schedule sample is truly a convenient way to get your maintenance tasks done. With a variety of samples to choose from that are also readily available online, what more can you ask for? Feel free to browse our website for sample schedule templates that we have available. Utilize them to easily and conveniently make your own maintenance schedule. We always want to do things the easy way, that is why a lot of life hacks and tips have been created and disseminated for the world to know. This in turn made our lives better. Home maintenance is one of those things that we want done easily because who would want to spend an eternity doing such tasks? So here are some effective tips on how you can maintain your home easily just like a pro. It takes a lot of hard work to clean and maintain glass windows and glass walls. You have to make them clean and shiny. But using soap and water will leave stain marks on the glass and that is still a lot of hard work. An easier way to clean glass windows and walls is with the use of a newspaper. It will definitely remove the dust and stains without leaving any scratch marks. There is no need for soap and water. Who doesn’t have home security alarms yet? I bet you already have one set at home. Since home security alarms are used to prevent break-ins, it is likely that it would not be used for very long periods of time unless your house is so prone to break-ins that you experience them a couple of times a year. It is a good practice to test your home security alarm at least once a month to ensure that it is still working. Doing home maintenance is the time when you need to take out your toolbox as you will be needing it for different kinds of fixes and repairs for your home. But having been kept in the garage for a long time, your tools would surely be all rusty. You can fix this by putting in several pieces of blackboard chalk into your toolbox. The chalk will absorb moisture thus making your metal tools rust-free! Have you ever tried cleaning your refrigerator coils before? They are those coils that you see at the back of your refrigerator that are often hot and untouchable. Refrigerator coils can be easily cleaned with the use of a vacuum cleaner. It is advisable to have it vacuumed every six months. This makes it free from dust and your fridge will also last longer. Cleaning sometimes can be hard, especially if you’re cleaning something big with hard to remove stains. Take for example your bathroom with a bathtub. Can you imagine the work needed to clean it up? Well, we have found a way for you to breeze through this task with the use of a hand drill with a foam ball attachment. This will effectively strip all the grime from your tub and tiles. We’re pretty sure that there are still a lot of home maintenance tips out there that you can use for your home maintenance needs aside from what we have listed above. We sure do hope that you will find any of these tips useful for taking care of your home and appliances. You may also check out our website to get more types of schedules, like holiday schedule, vehicle maintenance schedule, and immunization schedule. Check them out now!